I love fall. The cooler weather (although it still feels like summer here), the fall colors, using my slow cooker more, and decorating for the fall holidays – Halloween and Thanksgiving. It can sometimes be expensive to decorate, especially when you want a high-end look, like something from Pottery Barn. I love shopping Pottery Barn, but sometimes it’s just not practical, especially when it’s seasonal decor. However, it doesn’t mean you can’t achieve that Pottery Barn look without spending a lot of money. While searching for some ideas, I found some great Pottery Barn Knock-Offs…. 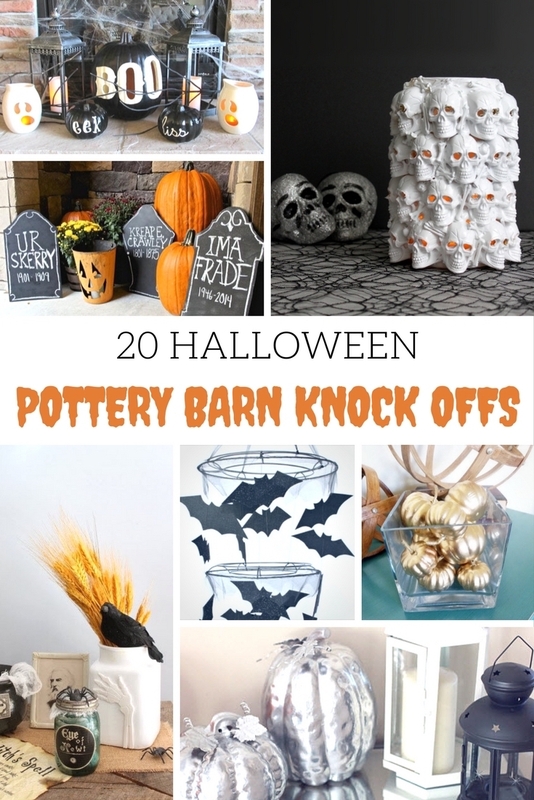 I hope some of these Halloween Pottery Barn knock-offs will inspire you this Halloween in your home decor decor. While you’re decorating your home, here’s a great Halloween ‘Bloody Bones’ cupcake recipe to try. And this hot cocoa halloween drink is perfect all October long.